Kubebond Diamond 9H is a liquid glass coating for cars that is developed by Choose NanoTech. When in the container, it is clear and transparent like water, however, after being exposed to air, the liquid becomes a rigid film like glass. As the liquid glass forms a permanent bond with the paintwork, it offers a more permanent protection as compared to the typical was or sealant paint protection products. Was recommended to try KubeBond by my colleagues. Spending lesser and lesser time cleaning my car already. Just give it a simple wipe and I am done! The service from 5D Solutions was really excellent! James and his team really helped to polish and coat my car and its so glossy now. Thanks! With the Revolution Bonding Technology, Kubebond is able to significantly reduce the surface energy of the substrate so that when any liquid comes into contact with the surface, it will be forced to form beads and easily roll off. Not only do the liquids roll off, the water repellent glass coating also carries with it any dirt or grime that is stuck on the surface thus keeping the surface of the car cleaner for longer periods. The 9H glass coating is able to provide superb scratch resistance against minor scratches because of its layering abilities. The matrix structure allows multiple layers to be applied to the paintwork and the toughness of the coating increases with each layer being applied. It is also the multiple layers of coating that protect the paint from tree sap, bird droppings, tar or brake dust. SGS is the world’s leading company in inspection, testing, certification and verification. Kubebond was developed by chemist with years of experience in the paint protection industry and is still being extensively researched so that it can continue to be the leader in car paint protection. The verification and extensive research is all done to ensure that customers get the very best car care solutions. Keen to find out more about the liquid glass coating? Come down to our showroom to see a live demonstration and speak to our staff to find out more about our ongoing promotions! The exterior liquid glass treatments provide protection for the entire surface of the car. From the mirrors and glass to the exterior paintwork as well as the wheels and rims. The Kubebond formula is suited for all the different types of surfaces. The Kubebond coating is also suitable for the protection of interior leather or fabric surfaces. 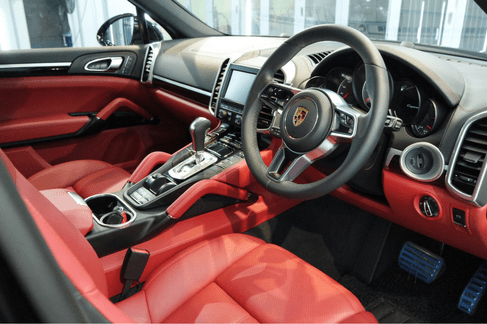 By carefully tweaking the formula, we can still provide the same coating that offers superhydrophobic effects thus protecting the interior from spills or stains. Choose 5D Solutions, we are the Approved Applicators of Kubebond and we have the proper tools and experience to ensure that you get the very best protection from our liquid glass coating.